Our "dichro bamboo" is so named because the irregularly spaced lengths of dichroic glass on the pocket resemble rows of bamboo. 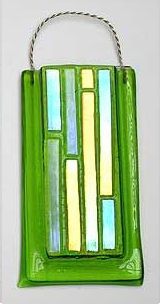 This stunning contemporary style is available in three pastel colors (turquoise, cherry and spring green) and three dark colors (red, bottle green and cobalt). 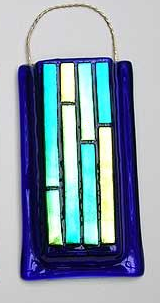 The dichroic glass on the pastels is clear backed and on the darks is black backed, giving a different color intensity. All colors are available in the each of the sizes shown, 2x4, 2x6 and 3x6.